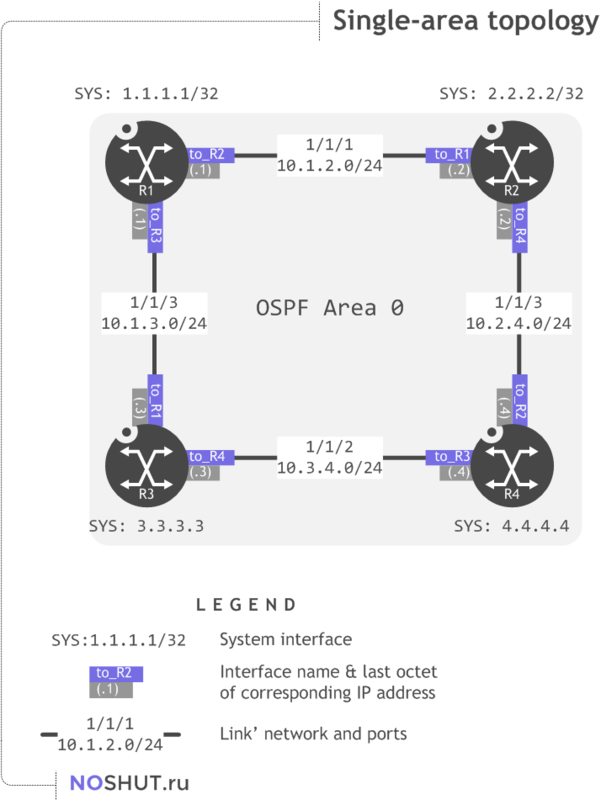 The purpose of this post is to cover basic OSPF configuration steps and commands. Intended readers are engineers with basic OSPF knowledge who want to know how to configure OSPF on Alcatel-Lucent Service Routers (7750-SR, 7705-SR, 7210-SR). All the examples are valid for TiMOS-B-12.0.R8 both/i386 ALCATEL SR 7750 Copyright (c) 2000-2015 Alcatel-Lucent. software. To enable OSPF on a router simply issue configure router ospf command. This will start OSPF process #0 on a router. If you would like to run another separate OSPF process on the same router, use configure router ospf <N> , where <N> is a decimal number of the OSPF process. Area ID value could be entered as decimal, like area 0 or in dotted-decimal format like area 0.0.0.0. # This command will enable OSPF process (it is disabled by default) and configure Area 0 on this router. Once backbone area is configured its time to add some interfaces to it with interface <interface_name> command. One of the most used OSPF verification commands is show router ospf database . 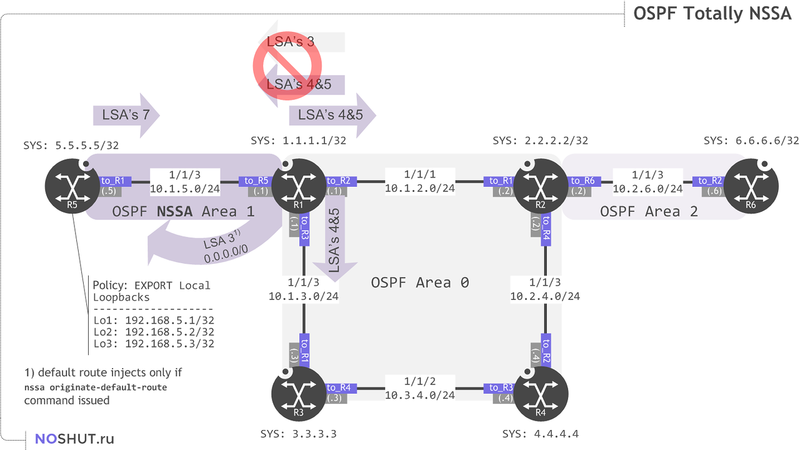 This command shows all the Links State Advertisements (LSA) and helps the engineer to troubleshoot OSPF-related issues. 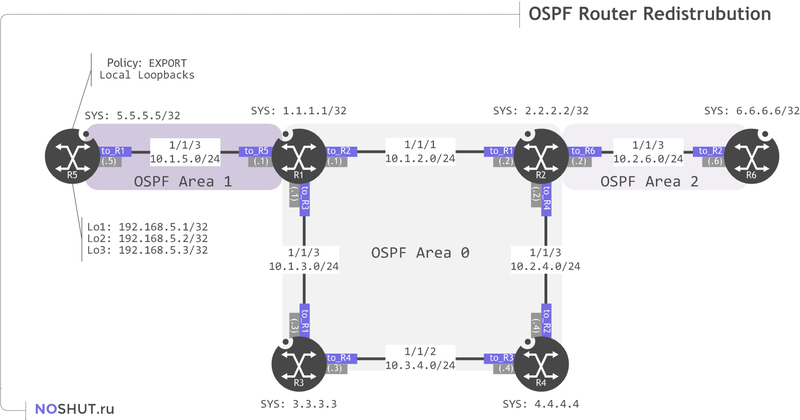 Basic Multi-area OSPF configuration is straightforward as well. I added two more routers to previous topology acting as core routers in two new areas: Area 1 and Area 2. We will start by configuring Area 1 on routers R5 and R1. Every command is from the previous section, so you wouldn’t face any problems. # Creating Area 1 on R1 and adding "toR5" interface to it. I repeated same configuration steps on R6: added it to Area 2 and neighbored with R2. Aha, R1 as being an ABR lists all LSA’s for both Area 0 and Area 1. Moreover, R1 lists Type 3 Summary LSA from Area 0 to Area 1 and vice versa, from Area 1 to Area 0. R5 has only Area 1’s LSA’s, since R5 lives in just one Area – Area 1. A:R6# ping 5.5.5.5 PING 5.5.5.5 56 data bytes 64 bytes from 5.5.5.5: icmp_seq=1 ttl=62 time=11.7ms. 64 bytes from 5.5.5.5: icmp_seq=1 ttl=62 time=11.7ms. So far we configured multi-area OSPF topology with three Areas. 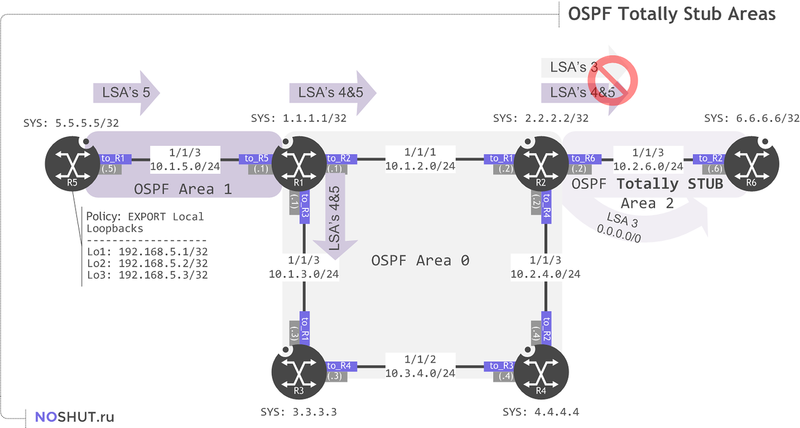 And one of the reasons to implement multi-area OSPF topology is the ability to perform manual summarization. 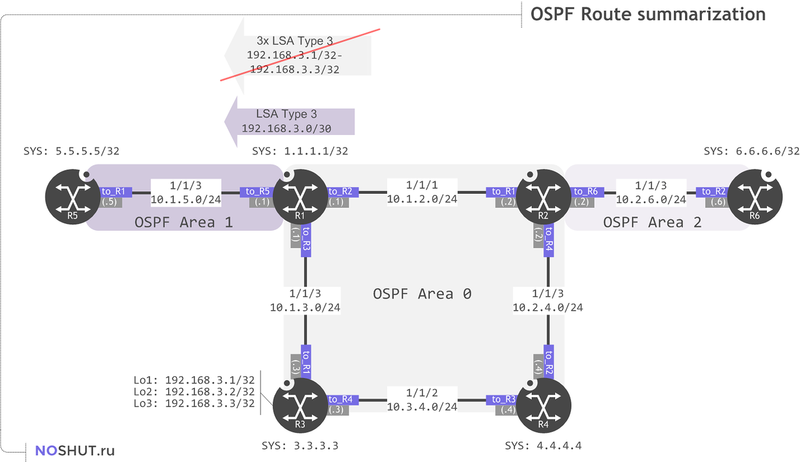 In this section we will configure OSPF route summarization between Area 0 and Area 1. Since we added these interfaces to OSPF we see them coming to R5 router as Type 3 Network Summary LSA. And these routes make their way to routing table. We will configure route summarization on Area Border Router (R1), so it will advertise only one summary route 192.168.3.0/30 instead of three specific routes. Pay attention, that summarization command area-range must be applied in the context of the area being summarized. Since we are summarizing routes from area 0 to area 1 then we using this command in area 0 configuration context. By default, adding command area-range <prefix>/<length> will actually place command area-range <prefix>/<length> advertise in the configuration, meaning that ABR will advertise this prefix. Counterpart statement not-advertise is used for route suppression and will be discussed in a detail in next section. Pay attention: route summarization procedure automatically places black-hole route in R1’s route-table. A:R5# ping 192.168.3.3 PING 192.168.3.3 56 data bytes 64 bytes from 192.168.3.3: icmp_seq=1 ttl=63 time=10.2ms. 64 bytes from 192.168.3.3: icmp_seq=1 ttl=63 time=10.2ms. You can filter unwanted routes on ABR’s with the same command area-range adding the key not-advertise. For example lets take a look at R6’s route table which contains specific routes to R3’s loopback addresses. These addresses is advertising by R2 since it is acting as ABR and advertises all the routes it has in its routing table. Note: Route filtering does not install any black-hole routes. Routes between different routing domains can me mutually exchanged. External routers can be exported into OSPF and vice versa. The process of routes exchange is often called route redistribution. In this section we will redistribute routes added by means of loopback interfaces created on R5. These routes are in R5’s route table but are not advertising to OSPF neighbor, since these interfaces are not included in OSPF process. *A:R5>config>router>policy-options# policy-statement "EXPORT Local Loopbacks"
# it is necessary to issue command "asbr" to make a router an ASBR *A:R5# configure router ospf *A:R5>config>router>ospf# asbr *A:R5>config>router>ospf# export "EXPORT Local Loopbacks"
*A:R5>config>router>ospf# export "EXPORT Local Loopbacks"
This “before | after” comparison shows that after configuring Area 2’s routers as stub R6 router no longer receives ASBR Summary LSA and AS External LSA nor it has routes 192.168.5.1-3/32. Instead it has a new Summary LSA from ABR with the Link State ID 0.0.0.0 which means default route. Now Area 2 router R6 has only 3 LSA in its LSDB. All Type 3 Summary LSA for networks inside Area 0 was substituted by Summary default route from ABR (R2). Not so stabby areas are basically stub areas with ASBR. It inherits the same rule of blocking Type 4 and Type 5 LSA and in order to distribute external routes from ASBR another LSA – Type 7 – is used. As soon we configured Area 1 on R5 to be NSSA we lost R1 as neighbor. This is the effect of mismatched Area type in OSPF Hello messages between two routers. Recall that R1 is maintaining Area 1 as a basic area, and Area 1 on R5 was reconfigured to NSSA. *A:R1# show router ospf neighbor "toR5"
OSPFv2 (0) neighbors for interface "toR5"
As we see, all Type 5 AS External LSA was substituted by Type 7 NSSA LSA. And if we had any other external routes we wouldnt see them in R5 database, since NSSA areas can not contain External routes. *A:R5# show router ospf database =============================================================================== OSPFv2 (0) Link State Database (Type : All) =============================================================================== Type Area Id Link State Id Adv Rtr Id Age Sequence Cksum ------------------------------------------------------------------------------- Router 0.0.0.1 1.1.1.1 1.1.1.1 1652 0x80000003 0xa685 Router 0.0.0.1 5.5.5.5 5.5.5.5 264 0x80000006 0x6998 Summary 0.0.0.1 0.0.0.0 1.1.1.1 53 0x80000001 0x75e4 NSSA 0.0.0.1 192.168.5.1 5.5.5.5 172 0x80000003 0xe34c NSSA 0.0.0.1 192.168.5.2 5.5.5.5 1199 0x80000002 0xdb54 NSSA 0.0.0.1 192.168.5.3 5.5.5.5 1163 0x80000002 0xd15d ------------------------------------------------------------------------------- No. of LSAs: 6 =============================================================================== *A:R5# ping 4.4.4.4 PING 4.4.4.4 56 data bytes 64 bytes from 4.4.4.4: icmp_seq=1 ttl=62 time=19.6ms. 64 bytes from 4.4.4.4: icmp_seq=1 ttl=62 time=19.6ms. For two OSPF routers to become neighbors several parameters should be matched. And most of them – are the parametes communicated via OSPF Hello messages. If you do not see the a neighbor on the other side – there is a good chance that one of these parameters mismatch. When you need to investigate what is the reason casing a neighboring relationships to break down debug should help. I will show you some debug commands to help you understand how to troubleshoot OSPF Hello mismatched parameters. *A:R1# show log log-id 55 =============================================================================== Event Log 55 =============================================================================== Description : (Not Specified) Memory Log contents [size=100 next event=22 (not wrapped)] 20 2015/01/01 03:11:31.28 UTC MINOR: DEBUG #2001 Base OSPFv2 "OSPFv2: PKT DROPPED hello interval mismatch" 19 2015/01/01 03:11:31.28 UTC MINOR: DEBUG #2001 Base OSPFv2 "OSPFv2: PKT >> Incoming OSPF packet on I/F toR5 area 0.0.0.1 OSPF Version : 2 Router Id : 5.5.5.5 Area Id : 0.0.0.1 Checksum : ec98 Auth Type : Null Auth Key : 00 00 00 00 00 00 00 00 Packet Type : HELLO Packet Length : 44 Network Mask : 255.255.255.0 Hello Interval : 5 Options : 08 -----N---- Rtr Priority : 1 Dead Interval : 40 Designated Router : 0.0.0.0 Backup Router : 0.0.0.0 "
Now the problem is clear – incoming OSPF packet came in with Hello timer set to 5sec. And R1 tells us that this value mismatches its configured Hello timer value. This debug technique should indicate every discrepancy in OSPF values that should match, be it authentication mismatch or area id mismatch. And that is all for this moment. Should you have any questions – do not hesitate, comment form is down below! Hello .. Thanks for writing wonderful article..
Can we use aggregate routes with OSPF, for eg on ASBR, can I write an aggregate summary-only and redistribute it into OSPF with export policy. It does work but I see both aggregate route and also specific routes via OSPF.